In a bowl, combine the P.A.N. Pre-cooked White Cornmeal, baking powder and salt. In a separate bowl, beat the eggs until they double in volume. Gradually add the yogurt on low and beat until thoroughly combined. Beat the dry ingredients into the mixture in three batches. Beat in the butter until the mixture becomes creamy. Preheat the waffle iron to medium-high and add the batter. Cook the waffles until golden. Serve hot and drizzle with syrup. 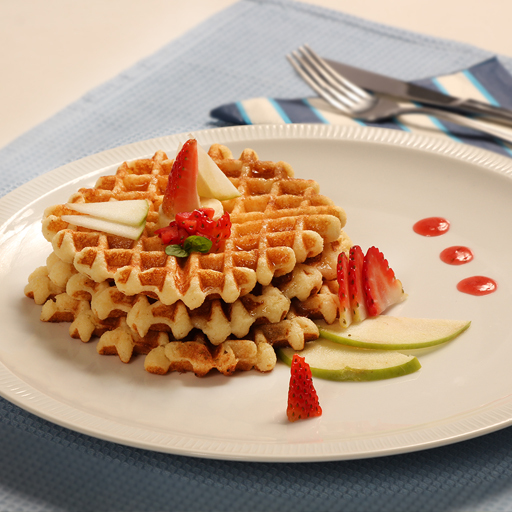 You can serve the waffles with butter, honey, syrup, jam or any other ingredient of your choice..